Spring is starting to come! Warmer temps, more rain. And Chicken Chase is just a few short weeks away! I've been riding some. Not as much as I'd like, but some. Mostly I ride Serts and pony Tanna so they both get some exercise. Just under 3 weeks ago, we got a new addition to the herd. 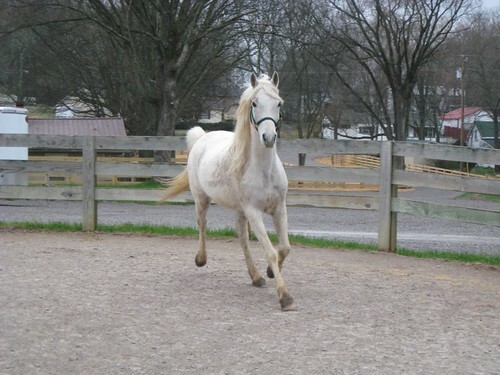 Cody is an 8 year old Arabian gelding. A little bit of Morgan blood in him. He is super sweet, smart and willing to learn. He's been a companion horse for years, so needs to learn or relearn most everything, including how to pick up his feet. Tanna and Cody get along great and play together. Serts and Cody finally have an uneasy truce. Serts did not like the new comer and would run him and bite him, but that has stopped after about a week of isolating Serts from the other 2. Until Chicken Chase, I'm pretty much going to be focused on Tanna and Serts, but plan to start working more often with Cody. He's not been ridden much, if any, so I will have to introduce him to that as well. April, the new horse is lovely! ~E.G. Super-cute horse! !Are you now the proud owner of THREE white horses?I feel like I'm always scrubbing legs with blue shampoo.They are so pretty to watch running around the pasture.